The Victorian state flag was created as a colonial flag - a British Blue Ensign with the badge of the colony added to the blue field. Because some of the Australian state badges were originaly created to represent the Governor (as distinct from the Colony) they generally showed some element of British royal heraldry - the main criteria being that it be different from similar badges used in other parts of the Empire. The Crown Victoria badge represented the status of the Governor as representative of Queen Victoria in the Colony. Victoria adopted the Southern Cross in 1870 initially for use on the HMCS Nelson - one of the early warships of the Colonial Navy. The Southern Cross had become fairly well associated with Australia during the 19th Century. Theoretically the Victorian badge [a crown above the five stars of the southern cross] was on a disc, but the disc was the same colour as the field, blue. This caused the British Admiralty some consternation, who suggested the Victorian badge should be redesigned as the southern cross on a blue shield on a white disc. In a rare display of independence (with respect to flags) the Victorian Government unilaterally approved the flag design anyway. Over the following decades, the southern cross "grew" outside of the nominal disc area, and eventually the pretence of the disc disappeared. The number of points on the stars indicates the varying brightness of the stars which make up the Southern Cross. There are 8,7,7,6 and 5 points for Alpha, Beta, Gamma, Delta and Epsilon Crucis respectively. The Australian national flag was originally designed to also follow this pattern. Victoria adopted the Southern Cross in 1870 initially for use on the HMCS Nelson - one of the early warships of the Colonial Navy. The Southern Cross had become fairly well associated with Australia during the 19th Century. An official history from the State gives the original adoption date as 4 February 1870. 28 February 1870. The Governor of Victoria informed the Colonial Office that the Executive Council had recommended the adoption of the Southern Cross as the badge of the colony. A drawing of the badge in the fly of the Blue Ensign was enclosed. The Colonial Office reply of 22 July 1870 stated that the Admiralty approved the design. Six years later the Governor received a draft sheet of the colonial badges that would appear in the Admiralty Flag Book and found that the badge of Victoria was shown as the Southern Cross on a blue shield on a white disc. He wrote to the Colonial Office on 10 July 1876 that the badge of the Colony of Victoria was still five white stars in the fly of the flag and that it was “not known whence was derived the device of a shield.” The Colonial Office reply pointed out that the badge was also to be used in the centre of the Union Flag on a white disc, where white stars would not be visible. The Victoria Blue Ensign became the Victoria State Flag after the Australian Blue Ensign was officially announced in 1903. 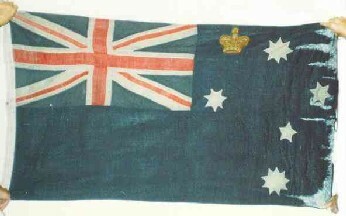 The Victorian Naval Contingent sent to Tientsin, China, to support Victorian troops during the Boxer Rebellion [in 1900] used a “recycled” Victorian Colonial Ensign. The Ensign was in fact an original 1870 Victorian Ensign, which was recycled into the 1877 “style” version, by having an Imperial Crown sewn near the top of the flag's field, between the Southern Cross and the Union Canton. The full details of this Ensign, which was presented to the Victorian Parliament after the Boxer Rebellion was written up by myself in Crux Australis [cxa] Vol.3, No.1/13 - Jan. 1987. The photograph of this Ensign was taken by myself shortly after it was stolen from Parliament and then thankfully found, in Sept.-Oct. 1986. Today, this Ensign is fully framed behind glass and displayed in an upper level corridor of Parliament House. From 12 November 1877 the badge was changed to include an imperial crown above the Southern Cross. In 1901, with the accession of Edward VII, this crown was replaced with the crown of St Edward, and the flag has not changed since then. Proclaimed 12 November, 1877; Government Gazette, No. 119, dated 30 November, 1877.
and Amended by Dispatch No.56, 19 September, 1901. Following the accession of Edward VII the Lieutenant-Governor of Victoria, The Honourable Sir John Madden K.C.M.G., informed the Secretary of State for the Colonies on 19th September 1901 , that henceforth the word 'State' would be used to in place of the world 'Colony', and that in the design of the state flag the St Edwards Crown would replace the Imperial Crown. If this is accurate it would appear that the State of Victoria preceded (at least in theory) the general adoption of the St Edward's crown by some 50 odd years. The words quoted by Christopher Southworth are taken from the State Flag sheet from the Insignia folder produced by the Protocol Section of the Premiers Department of the State of Victoria - no date, but probably about 1985. Like several other Australian state government insignia booklets, this document had significant errors, including that identified by Christopher. The document should have stated that the "Tudor Crown" would replace the "Imperial Crown", and it should then have further gone on to state that in 1953 the "St Edwards Crown" was adopted. The relevant source is a Colonial Office despatch dated 14 June 1901 which requested that the use of the "Tudor Crown" be adopted throughout the colonies. The Governor General of Australia had earlier requested each of the State Governors to provide advice on whether any of the new states wished to change their seals or flag badges having regard to the formation of the Commonwealth of Australia on 1 January 1901 and the accession of King Edward VII. The Victorian Premier Alexander Peacock advised Lieutenant-Governor Sir John Madden (acting Governor) on 27 August 1901 that there needed to be only minor changes to the Seal and the change to the drawing of the Crown on the state badge. This advice was communicated to the Secretary of State for Colonies in the despatch quoted by Christopher and a similar letter to the Governor General. Another error on the Insignia sheet was that Victoria's first Colonial warship was described as H.M.A.S. Nelson , when it should have been H.M.C.S. Nelson - one of Her Majesty's Colonial Ships, rather than an "Australian" ship. My copy of the publication had hand changed this error to the still erroneous H.M.V.S. Nelson! Apparently, in 1901, the "Tudor Crown" and "Imperial Crown" were not one and the same. It is strange that the title "Imperial Crown" has been transferred from the "St Edward's Crown", to the "Tudor Crown", when the former is similar in appearance to the "Imperial State Crown", while the "Tudor Crown" is not. An image of the "Flag Badge" with Tudor Crown for use in Victoria, either on the State Flag (as shown), or within a dark blue shield on a white disc on the State Governor's Flag from 1901-53 was prepared by the British Admiralty in 1903. This image has written on it "Badge as amended in 1903." [my emphasis] Was this the badge in use from 1901 and, if so, does anyone know why it might have been amended, rather than simply approved by the Admiralty in 1903? The note by the 1877 shield badge indicates that it was approved in Admiralty letter 5301 of 1878. The badge has been scored through because it was no longer correct. Written below and to one side of it is the note, "See Admy 29663 [over] 1901, General - Amended Badge" and again, "See Admy 29663 [over] 1901, (amended badge)"
Thus the round badge is that shown in 1903, but the correct version of the shield badge is in Admiralty letter 29663 of 1901. When the Governor of Victoria informed the Colonial Office that the Executive Council had adopted the Southern Cross as the badge for the fly of the Blue Ensign [in 1870], he added that the Council had also recommended that, subject to the approval of Her Majesty the Queen, it should be the distinguishing mark in the fly of the Red Ensign of ships registered in the colony. The Board of Trade were responsible for regulating merchant shipping and the Colonial Office, which had not expected a request of this nature, considered consulting them, but probably did not. On 22 July 1870 the Colonial Office informed the Governor of Victoria that, together with the Blue Ensign, the Red Ensign was approved. In March 1874 the British Consul in Le Havre reported that "British ships registered in the North American provinces have a Red Ensign with a kind of shield, on which are displayed sundry emblems, in the fly thereof. I am informed by their captains that it is the flag of the Dominion of Canada and is given to all vessels belonging thereto and clearing out therefrom, and that they have to pay a certain sum for it." The Consul asked the Board of Trade for instructions as, in his opinion, this rendered null and void, Section 105 of the Merchant Shipping Act of 1854, and paragraph 17 of the Board of Trade Instructions to Consuls. In May 1874 the Colonial Office asked the Admiralty to confirm that vessels registered in a colony were entitled to wear a Red Ensign bearing the badge of the colony in the fly. On the 22nd the Admiralty replied that this was correct. There matters rested until July 1875 when the Admiralty wrote to the Colonial Office saying that the letter of 22 May 1874 had been written “under a misapprehension of the exact state of the case, and in the belief that the proper authority had been obtained, and that such use of the Red Ensign with the badge of the colony was in accordance with the orders bearing on the subject, which, however, now appears not to have been the case.” It was suggested that the matter should be explained to Governors of Colonies. The Colonial Office circulated drawings of colonial flag badges to all governors on 23 August 1875. The last paragraph of the covering letter stated that to avoid unnecessary expense there was no objection to continued use of inadvertently approved Red Ensigns with the badge of the colony in the fly until it was convenient to change them. A Proclamation in the Victoria Government Gazette of 10 December 1875 rescinded that part of the 1870 Proclamation that referred to the Red Ensign. The probability that use of the Victoria Red Ensign continued, is strengthened by a memorandum sent to Alexander Peacock, the Premier of Victoria, by the Lieutenant-Governor in 1901, saying that there should be “no alteration to flags except under the terms of the Colonial Office Despatch of 14 June; the Tudor crown for that at present in use.” A note dated 24 February 1902 was added to the memo. 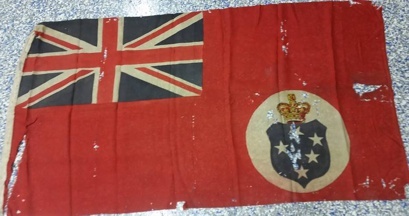 “For government vessels : British Blue Ensign with Southern Cross and crown on fly. For merchant vessels : British Red Ensign with Southern Cross on fly without crown. In the Cigarette album Wer nennt die Länder, kennt die Fahnen, edited by Massary cigarette manufacturers, Berlin, before 1933; p.52, series 76, image no.57 (see [neu29]), the Victoria ensign is illustrated as a red ensign with a blue disc in the fly end. On the disc are five white stars topped by crown. The flag has mcg 1877 colonial office printer and new stand stamped on it. Its use is unknown. The Sesquicentennial flag of the State of Victoria, Australia, as shown on http://museumvictoria.com.au/collections/items/252036/flag-sesquicentenary-victoria-growing-together-1984-5. The flag is blue, green, white and black flag commemorating the 150th Anniversary of the founding of Victoria. In centre of flag, emblem of Victoria's 150th Anniversary. Flag made from nylon with canvas left hand edge and two brass buckles at top left and bottom left. There is a maker's label on canvas.